Build your own Zip line with this high quality Trolley with handle bars for maintaining direction, must be used with harness, you cannot hang from any trolley as its not safe, as part of the safety feature this trolley is designed to stop working if used without a harness. Comes with handles but no carabineer and no cable. Comes with handles but no carabineer and no cable. Handel bar grips subject to upgrades from time to time and may not be exact as pictured. Weight is almost 4 pounds and wheels are 2 inch. This is an extremely well made quality trolley, very impressive, no disappointments. Make sure you get professional advice before setting up a trolley zip line system as they can be dangerous to the point of death if not used correctly and maintained regularly. You also need to accept responsibility to monitor or supervise anyone using your zip line. Use an independent safety like a trailing carabineer to protect against primary failure of the trolley. Use other precautions including but not limited to landing mats and helmets and protective clothing. Take precautions against your hair getting caught in the trolley or other loose items getting caught. Get professional advice and training. I only sell the trolley, you must accept all and full liability for its safe use or proper applications. I do not advise anyone on how to setup a zip line that's your responsibility. DO NOT BUY THIS trolley if you are unwilling to read this warning and accept all responsibility as outlined here. Please read the enclosed warning supplied with each trolley. I can't begin to list all the potential hazards associated with building and using zip lines so use your head and get training before you build your system. Trolley will not work correctly and may stop if used without harness. Thank you for reading and following these instructions. Professional Grade highest quality trolley on the market. Will attach or detach at any point in the line without tools and its the only one of its kind. Fits 1/4 - 5/16 - 3/8 - 7/16 or 1/2 inch Cables. Comes with handles but no carabineer and no cable. Trolley features dual ball bearings (two sealed bearings in each wheel), giving it an unequaled speed and smoothness. 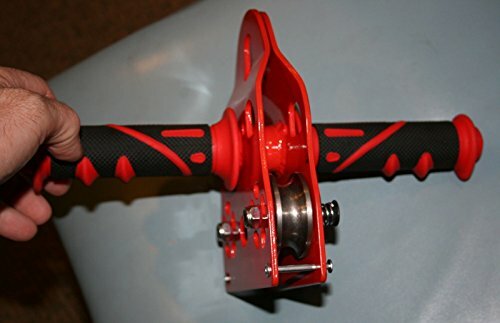 1/2" cable capacity, and 120mph speed rating gives you a pulley that will knock your socks off.